Facebook is one of the most popular social networking website in the world. Almost everyone who is on the Internet has a Facebook account. One of those features is the Live Chat that was introduced by the facebook. 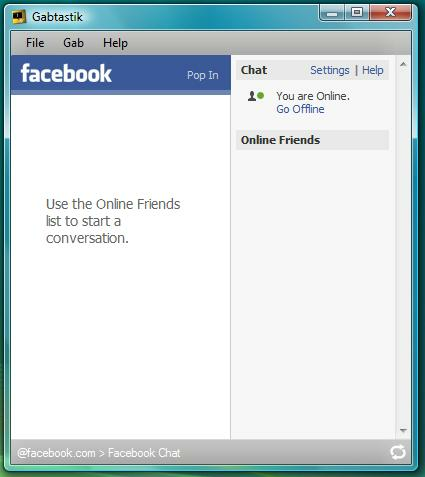 However, its something like Gmail chat, which can be used with a Google Talk client, Now we can use Facebook’s online chat on desktop with Gabtastik.So if you love to chat with your facebook buddies on facebook, now you can directly chat with them straight from your desktop. Gabtastik is a site specific browser (SSB) built so you can use these online chat services in a separate window. Gabtastik lets you use online chat services just like if they were separate applications. Gabtastik lets you keep chat sessions open on your Windows desktop outside of your regular web browser, using minimal screen real estate and system memory. Gabtastik also lets you specify window display level and window opacity, and lets you toggle quickly between supported chat services. The interface is clean and Gabtastik lets you open up multiple chats in multiple tabs. So far it only works with Google Talk, Facebook Chat and meebo. Gabtastik also lets you specify window display level and window opacity, and lets you toggle quickly between supported chat services. All in all, it’s a pretty neat little app.